Thank you for visiting the web site of the Historical Society of Windham County in Newfane, VT. The museum is located on the main street (Route 30) in Newfane, one of the most beautiful villages in Vermont and listed on the National Register of Historic Places. Visitors to the museum have been delighted by the quality of our collection. The County Museum and the West River Railroad Museum will open for the season on Saturday, May 25, 2019. (Memorial Day weekend through Columbus Day weekend). Meanwhile, please feel free to contact us by E-mail with any inquiries, or submit genealogy requests on the form provided. County Museum hours: Wednesday, Saturday and Sunday from Noon – 5:00 PM. (Also by appointment.). 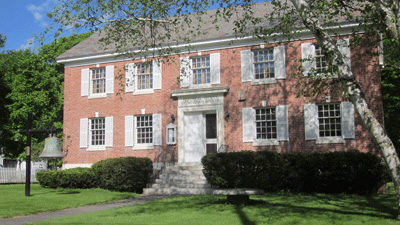 Admission: Admission is always free to the Museum of The Historical Society of Windham County. Become a member of the Historical Society of Windham County to support local history. Your membership includes a subscription to our newsletter, free admission to our Summer Programs, and more. Join today.